Published: Sept. 21, 2017 at 10:20 a.m. 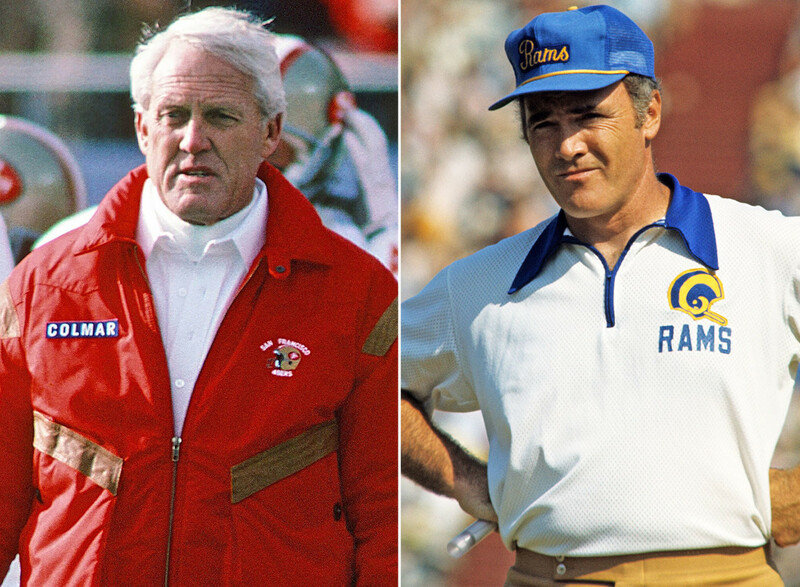 The Rams and 49ers have been facing off for seven decades. How do the best all-time players from each franchise stack up against each other? Adam Rank breaks it down. Knox led the Rams to five consecutive NFC West titles from 1973 to '77 before he bolted for Buffalo. He ranks 10th all-time in career regular-season wins. But Bill Walsh is credited with the invention of the West Coast offense, led the 49ers to four Super Bowl wins and is in the conversation for best coach ever. Listen, Craig is one of the most underrated running backs in NFL history. He was so key to those 1980s 49ers teams (and frustrating to watch, as an opposing fan). If you want me to co-sign a memo to get him into the Hall, I'm happy to do it. But E.D. is one of the best running backs in NFL history. Top five, easy. Hey, finally one for the good guys! Hirsch had 1,495 receiving yards and 17 touchdowns in 1951. A great season by today's standards -- and an absolutely ridiculous season by 1950s standards. Remember, teams only played 12 games in that day. "Crazy Legs" averaged a whopping 124.6 yards and nearly 1.5 scores per week in '51. How would you like that on your fantasy team? But still, he's going up against Rice. Damn it. Thanks to the aerial evolution that has occurred over the past couple decades, it's hard to be wowed by Fears' numbers from the mid-20th century. But he did lead the NFL in receptions from 1948 through 1950. T.O. is a great player whose antics taint your recollection of how dominant he was. He should be in the Hall of Fame. But he's not (yet). Fears is. Still, I have to go with Owens. Even as it kills me a little inside. Davis was legitimately one of the most impressive tight ends I've ever seen play. Also a clutch performer for the 49ers in the playoffs. And in all honesty, I had to go to Turf Show Times to help jog the memory regarding prominent Rams tight ends. (I was going to put Troy Drayton on this list.) Truax was good, and like most good Rams, he won a Super Bowl with somebody else. So, I'm going Davis. The 1980s 49ers had some great interior linemen in Guy McIntyre and Randy Cross, who were able to keep Joe Montana clean for the most part. But those Rams hog mollies ... They graded the road for Eric Dickerson. And great line play led to Charles White leading the NFL in rushing in 1987. Yeah, the line of the 1980s 49ers was pretty good. I get that. But I've ceded many positions to the Niners despite the Rams having Hall of Famers at the same spots. So, sorry, not sorry that I'm giving this to the defensive line of Deacon Jones, Merlin Olsen, Rosey Grier and Lamar Lundy -- a.k.a, the greatest freaking defensive line of all time. Haley was a beast. He's in the two-man club with Tom Brady as the only players in NFL history with five Super Bowl rings. The thing is, three of Haley's titles came with the Cowboys because he wore out his welcome in San Francisco. The Rams never got tired of Youngblood. And not only did he play in the Super Bowl with a broken leg, he played in the PRO BOWL THE FOLLOWING WEEK. Don't even. Deion was one of the most electrifying players in the NFL, not only as a shutdown cornerback but as a punt returner. He is also the only reason Steve Young won a Super Bowl title. Lane broke the NFL record with 14 interceptions during his rookie season. I'm going Lane because he was much more physical. Are you kidding me right now? No contest. Much love, Deion, but even you must acknowledge "Night Train" is one of the greatest nicknames in human history. Cromwell was one the NFL's best in the 1980s. He was a four-time Pro Bowler (1980-83) and the leader of the Rams' D forever. But Lott is still considered one of the greatest safeties in league history. He was the Joe Montana on the defensive side of the ball for the 49ers during their glory days. The Rams traded 11 players to get Richter back in 1952. He made it to the Pro Bowl in eight of his nine years in the league. But he also played both center and linebacker in 1962. Willis was one of the best of his era, and a key to the 49ers' most recent run of success. He was a Pro Bowler in seven of his eight NFL seasons. It's tough, but I'm going with Willis, who will one day be in the Hall of Fame. Am I really talking kickers here? Wersching won two Super Bowls with the 49ers and nearly put up 1,000 points for them. But Zuerlein has earned the nickname "The Leg" -- partly because it rhymes with his first name, but also because he's got such a strong leg.